The 5 min opening bell bottoming tail trading strategy is an aggressive entry into stocks at the end of the first 5 min after the opening bell. This trading strategy is suitable for traders who like to trade right after the open. You might only need to trade for only the first hour and sell it before the first hour is up. Sometimes the job is done in less than 15 minutes. To be able to trade the 5 min opening bell bottoming tail trading strategy, you need to be very vigilant. It is best to have a basket of stocks that you trade again each and every day. That way you will be able to spot them quickly. The Nasdaq 100 stocks are very good trading candidates for this trading strategy. If you only scroll through the 100 stocks every morning, you will soon be able to specialize. These stocks also offer enough liquidity to take advantage of the opening bell bottoming tail. As the Nasdaq 100 stocks are some of the most widely traded stocks in the world, you can definitely make a living just trading the bottoming tails that appear in the first 5 minutes in these stocks. To be able to fully take advantage of this trading strategy, the trader needs to first of all understand what is a bottoming tail. The image above is what a bottoming tail looks like. They will have a small body and a long tail. 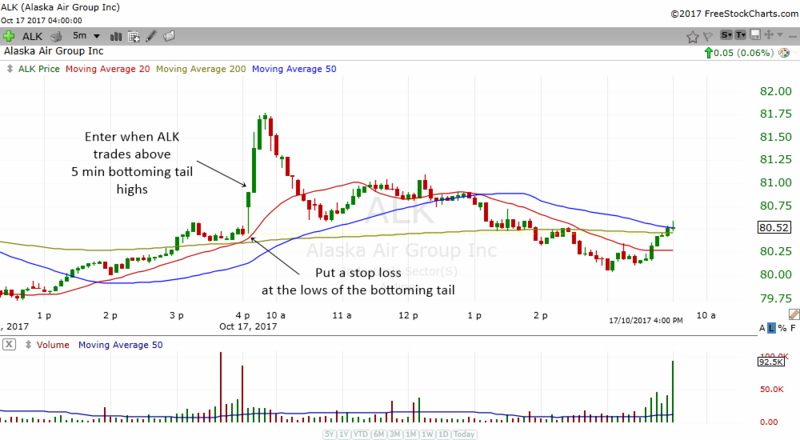 The idea behind this candlestick pattern is the stock opened and traded lower in the first 5 minutes of the day only to close back near the top. This shows us that the bulls are in control. There was some selling at first but by the end of the first 5 minutes, the bears were completely decimated and the bulls are now in full control. The appearance of a bottoming tail can often trigger a move up. This is where the trader comes in and ride the wave higher. 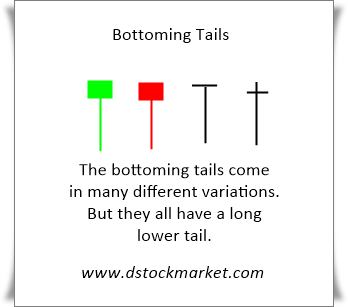 Bottoming tails can come in different variations as you can see in the image above. Sometimes, some traders call these pattern hammers. They all look the same and after some time observing them, you will begin to see that they all have long tails. Let's take a look at some real live examples so you can understand how the 5 min opening bell bottoming tail trading strategy works. The above is a 5 min chart of the popular stock NVDA. NVDA is a component of the Nasdaq 100 Index and therefore it is highly liquid and will provide excellent day trading opportunities. If you look at each 5 min candle's volume you can see it can trade anywhere between 50k shares to 500k shares every 5 minute. This is ample liquidity for day traders. In the chart above, you can see that each bar represents 5 min of trading. On the morning of Oct 17 2017, the stock gap down but within 5 minutes it formed a bottoming tail. The next 5 min also experienced some sell off but it also eventually formed another 5 min bottoming tail. 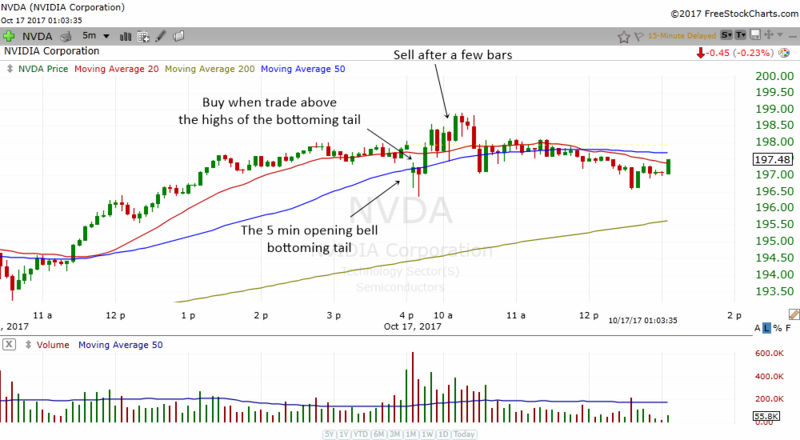 Using our trading strategy, the trader can enter NVDA the moment it trades above the highs of the first 5 min bottoming tail. The stock immediately rises and the trader can quickly take his or her profits within a few bars of trading. We do not really know how high a stock can go. It depends on the pattern of the stock in the daily chart. But we can often expect to get at least a 1:1 risk reward ratio. It is not impossible to get a 1:3 risk reward ratio which makes this trading strategy a winning trading strategy in the long run. Now that you have some understanding on how this trading strategy works, we will look into the criteria to find these stocks. Here are the things to look out for in searching the best trading candidates. The chart above is the 5 min chart of ABC. Right after the opening bell, the stock formed a bottoming tail. The stock satisfies quite a number of criteria. The trader can enter ABC the moment the stock trades above the highs of the bottoming tail. 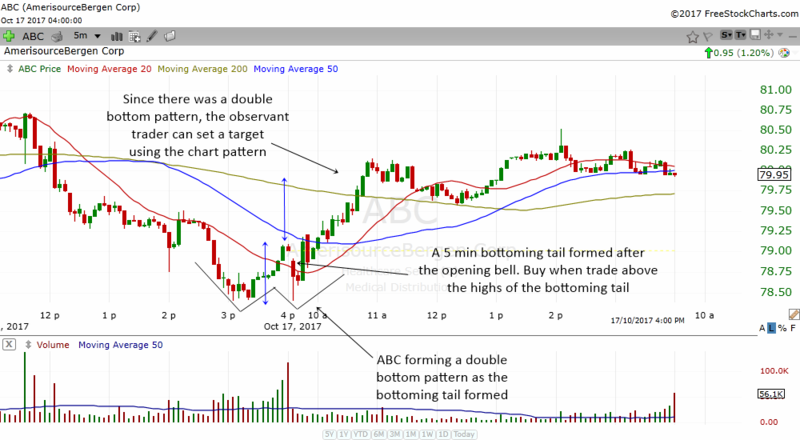 Since the stock was forming a double bottom chart pattern, the observant trader can usually use the chart pattern's price target to get a target for his day trade. *Please note that some stocks may have too wide a bid ask spread right after the opening. Their bid ask spread may narrow as the day progresses. So if the bid ask spread is too big in the morning, then don't trade the stock. I'm not sure how big the spread in ABC is right after the open but its spread is about $0.05 in normal trading hours. I think by now, if you are observant and smart you would already know how to enter and put a stop loss. But let's take this a step further and show you an example of how to enter this trading strategy and how to put a stop loss. In trading stocks, entry is the key to getting the best price possible. Stop loss is also important because as you know, there will always be setups that won't work. Here at Dstockmarket.com we always emphasize the need for stop losses because the reality is not always like what the advertisements say. There will always be trading losses and you need to get use to it. I think the very fact that there is a bottoming tail in the chart pattern makes it easy to plan the trade. This trading strategy is not as complicated as other trading strategies. You just need to find the bottoming tail. Once you have found the bottoming tail, the procedures are quite automatic. So for example, in the chart of ALK above, the stock opened and immediately formed a 5 min bottoming tail. The trader just needs to buy the stock the moment it trades above the highs of the bottoming tail. Put a stop loss at the lows of the bottoming tail. The trade worked out pretty fast and the trader would have finished his job in less than 15 minutes. That's one of the beauties of trading the opening bell. Not many people know how to trade the opening bell but now that you have stumbled upon this trading strategy, you now have a solid plan on how to tackle the opening bell of the US stock market. The next important question that the trader needs to answer is "How Do I Take Profits?". This is not a simple thing to answer. But my advice is this : Always be prepared to take profits and exit the trade after the first 10-15 minutes. This trading strategy is a fast in fast out trading strategy. The maximum holding period might be 1 hour. Sometimes the stock may continue to move higher especially when it is a very bullish day for the market. But these situations are very rare and therefore you should pay attention to the general rule of "start to consider taking profits after the first 10-15 minutes". In the chart of APA above, you can see the importance of taking profits after the first 10-15 minutes of trade. If you were to hold on for an hour, your profits would turn to a loss before the stock goes back up again. This can be very frustrating to traders. Remember that in trading, we seek to take small profits which at the end of the day adds up to a big amount. We are not all out to make a big home run. That is more for investing. Little wins will add up to a big amount at the end of the week for a trader. I'll try and explain in more detail about the risk reward ratio way of taking profits. If you are making a 1:1 risk reward ratio, it is always good to take some profits off the table. What do I mean by the 1:1 risk reward ratio. For example, if you plan to risk $500 on the trade and you are now making $500 when the stock runs up, that is a 1:1 R/R. Since you are making $500, why not sell 1/2 of the position and get the $250 profit in your account? Then put a stop loss at the breakeven which is your purchase price. You can ride the other 1/2 higher. Monitor the stock every minute and see if it can go any higher. Sometimes it will not go higher but sometimes it may surprise you and go higher. Especially when it is a strong trending day, the stock can go up $2-$5 and the 1/2 position that you still have will give you a big amount of profits. If you have sold everything you would not have any shares left to ride the trend higher. You may regret selling 1/2 if the stock trends up a lot. But there's always a give and take situation. How will you know that the stock will ride higher if you do not sell it? You might just end up losing all your profits if the stock tanks. So, don't regret too much if you sold 1/2. At least you still got the other 1/2 to ride the trend higher. The example above shows a good reason why you should sell 1/2 and ride the other 1/2 higher. 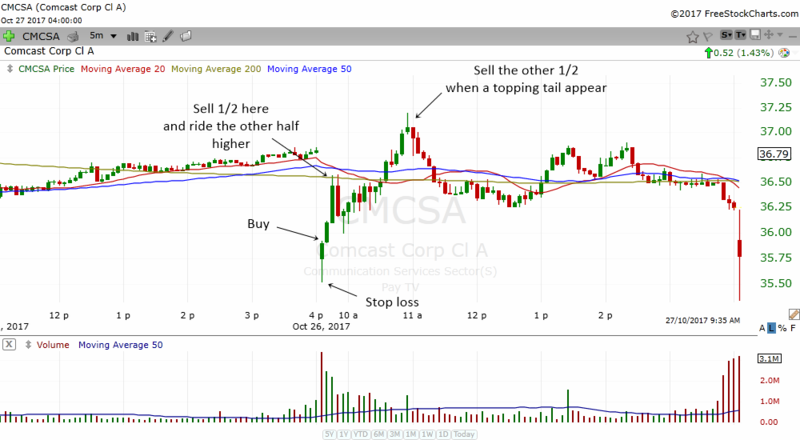 CMCSA gap down lower at the opening bell but it immediately formed a bottoming tail. Suppose if you buy the stock you would buy it when it trades above the highs of the bottoming tail and put a stop loss below the bottoming tail. As it trades higher and hits the resistance area from yesterday, you sell 1/2 of your position. The stock close the gap in just 10 minutes. You keep the other 1/2 and ride it higher. Around 11 a.m. the stock formed a topping tail and you are worried that the stock may go down. So you sell the other 1/2 of the position after the topping tail appeared and you take the rest of the day off with some nice profits. 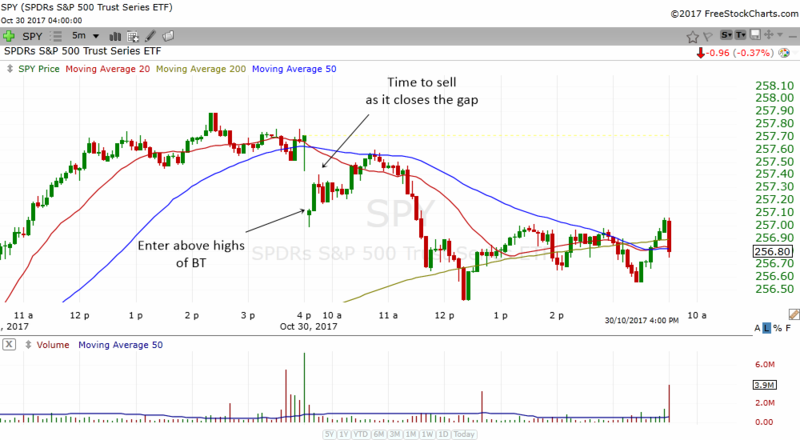 The chart of SPY above shows why it is important to sell the position when SPY reaches a resistance area in the charts. Just after the opening, the stock formed a bottoming tail and created a setup. Traders can buy the SPY and in just 10 minutes, SPY closed the gap and traders could close the position. The previous day's congestion area acted as a resistance area. Many stocks or indexes tend to close the gap before resuming lower. Which is why it was important that the trader take the profits faster when there is resistance overhead. On the other hand, when a bottoming tail appears after a period of consolidation in the previous day, we can often have a nice run up in the stock. 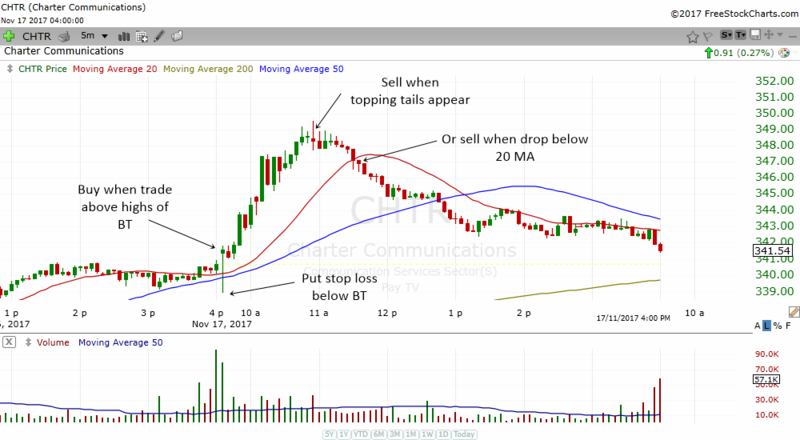 CHTR actually formed a bottoming tail and break out higher above the consolidation. This provided a nice breakout rally. In this kind of situation, the trader can hold on to the stock till he or she sees some reversal signs such as a topping tail. Or they can use a moving average such as the 20 MA to lock in the profits. In the example above, the trader can sell the position after the appearance of the topping tail or when the stock drops below its rising 20 MA. The above example is a great example of when the bottoming tail will give the trader a home run. Just look at ADI and you will realize that this could be a 1:8 risk reward ratio situation. Meaning, for every $500 you risk, you might get $4000. Well if you sell it partially on the way up, you might not get such a big R/R but it is very possible to get at least a 1:5 R/R. Repeat this kind of trade a few times a week and your trading account will be up significantly. First of all, ADI experienced a gap up. It gap up slightly above yesterday's consolidation. The trading range that was formed yesterday created a support area which makes the path of least resistance for ADI on that day to be up. ADI formed a nice bottoming tail in the first 5 min of trading and the trader could have bought the stock the moment it trades above the bottoming tail and put a stop loss below it. The stock immediately gives the trader a nice profit. 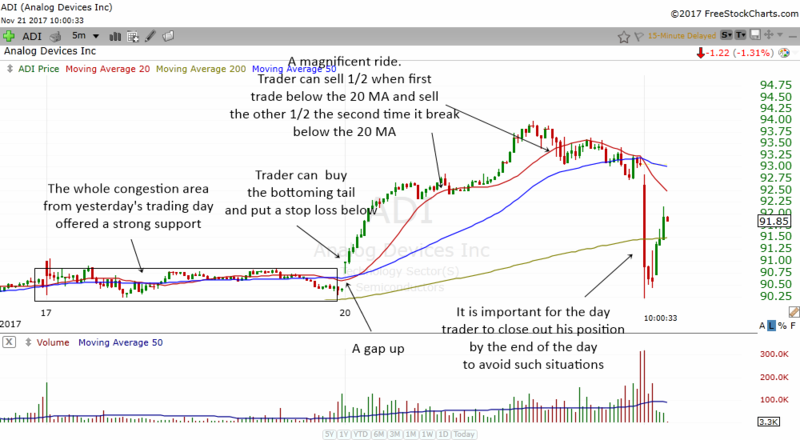 When you see such a strong trend in the stock, you can use the 5 min 20 MA as a tool to know when to sell the stock. 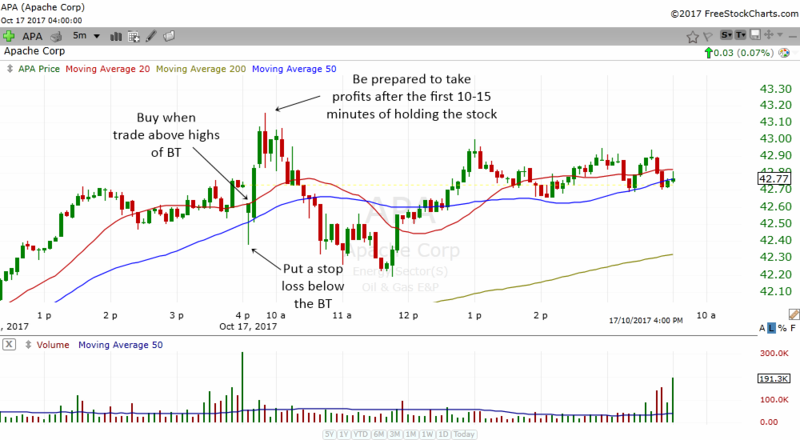 Whenever the stock drops below the 5 min 20 MA, you can sell 1/2 of the position. So, by the end of the day, the trader would have closed out of the trade. This example illustrates how important it is for a day trader to close out his or her position and not allow it to be open overnight. The next day, the stock gap down and gave back all its gains within the first 5 minutes. I will try to add more and more examples when I find them. If we have lots of examples to look at we will be able to learn more and be able to spot them better next time. The above is the charts of MU. On the left is the daily chart of MU and on the right is the 5 min chart of MU. As you can see from the daily chart, the stock is in an uptrend and therefore, it is very conducive to play longs in the intraday charts. If you play long intraday setups in a stock that is trending up in the daily chart, you are actually playing with the trend. As the saying goes, the trend is your friend, so its best to follow the trend and trade in the direction of the trend. MU formed a bottoming tail right after the open. Notice how it formed the pattern with heavy volume. The gap up help the stock as well. Heavy volume shows buying interest and therefore the odds of a successful trade increases. The trader can buy the stock the moment it trades above the highs of the bottoming tail and put a stop loss below the low of the bottoming tail. Some traders will sell 1/2 or 1/3 after 10-15 minutes of rise. But since the SMH was in new highs, traders can often opt to ride the other half higher to around noon and see what happens. MU also formed a nice 5 min consolidation at 20 MA breakout setup and it went higher. As the stock flatten out around noon, the trader can sell the other remaining position and close the day on a positive note. The above is another recent example which happened on February 12 2018 where Apple formed a nice opening bell bottoming tail. Apple is a very liquid stock so one can really play this strategy very well without worrying about liquidity and bid ask spread. 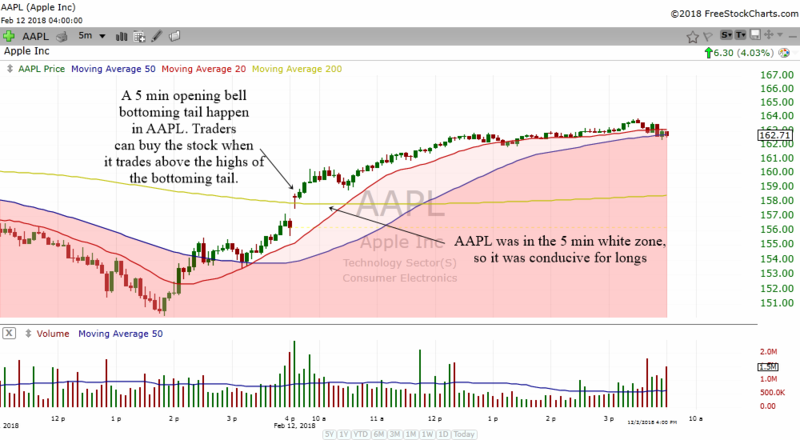 Since AAPL is in the white zone in the 5 min chart, it was conducive for long trades. The white zone is where the stock is above the 5 min 50 MA. Traders can wait for the first 5 minutes to past and when they spot a bottoming tail, they can buy the stock when it trades above the highs of the bottoming tail. See how fruitful the trade was! The 5 Min Opening Bell Bottoming Tail Trading Strategy is a simple yet effective day trading strategy to play stocks right after the open. Be sure to be observant in the first few minutes of the trading day. As you see a stock forming the bottoming tail, get ready to enter. You can finish the trade in 15 min and usually under an hour and take the day off. That is the beauty of this trading strategy.